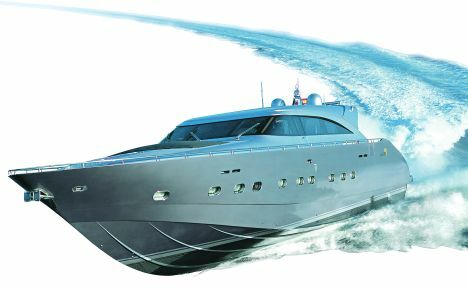 Sporty look and great technological content for this recent flagship of the AB Yachts shipyard which has always specialised in the production of hydrojet powered vessels. Some people think velocity is simply the physical quantity meaning the swiftness with which the position of a moving body changes along a fixed direction while others consider it a passion, as the salt of the earth giving the life sense with its strong emotions. Above all velocity means in various fields hi - tech today, namely the conceptualization of realizing very desired objects with avant - garde building methods and materials and possessing something representing the best technology; all this guarantees the quality of the object itself while offering a sport image. Propulsion system: Hamilton HM hydro jets. We think this latest flagship AB 88 by AB Yachts, since many years inside the Fipa Group, makes the most sceptics about speed ready to change their mind about. Yes, because on board strong feelings aroused by performances understood as pure velocity and high developing capacity, are wondering enjoyable without penalizing comfort and safety thanks to solutions and details studied on purpose for. All this because AB Yachts is not only a shipyard specialized in sport - crafts but for all because it has always produced only crafts moved by hydro - jets. Actually, thanks to this craft - design feature the whole AB range can offer either speed or ease of manoeuvring able to make newcomers wonder for this latest yacht - she is only 24 metres in length - which don't disappoint somebody's expectations at all. The adjective "technological" is often misunderstood, .but sure not onboard an AB. First of all the structure of this yacht is built with technology and features coming from aerospace research being able to perform stress strength, highest rigidity and able to reduce vibration wave - wake. Still towards this task the yard together with qualified partners has got ready a fairly unusual structure building system by utilizing special resins able to greatly replace screws while making at the same time the whole even more solid ale. Solidity and weight - saving are also guaranteed in building hull and deck in the way they are in high strength sandwich, composite, resins, oven - cured under vacuum for highest rigidity. So not only less moving masses and less stresses to overcome but also less weight to be lifted by a pairing of very powerful engines fitted onboard AB 88 are achieved by. 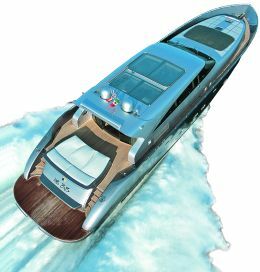 Suffice it to consider that this yacht can feature CRM props providing up to 3ž2.100 HP, right chosen for the structure of these thermo - units working without flywheel, which ensures reducing vibrations too. Assisted by a pairing of 2ž2.030 Muts, the engine can provide a maximum speed of 51 knots. As already said above, since 1992 - the year of birth - researching towards performance, comfort and safety has always led the yard to provide this yacht as well as all their crafts with hydro - jets. Moreover, the Hamilton HM 571 or MJP 450 allows AB to manoeuvring on a short sea thanks to her reducing draft due only to her bottom which this kind of solution offers. Let us now tell something about the interior layout of this "open" covered by a hard - top. 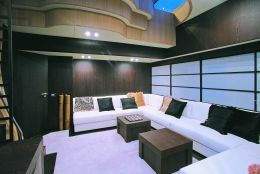 On the lower deck the sleeping area has amidships a full - beam owner's stateroom, as even more this type of yachts features, and a centreline double with en suit bathroom to starboard, dressing room to port and office corner. Going forwards entering in the first internal saloon there is a C - living area accessible from a small access area leading to two guest cabins: a Vip suite with centreline double and a twin cabin, each with private bathroom. The enclosed part on the main deck covered by a fold - down top features a huge saloon where we find a comfy "L" dinette around a table. Forward of it, between the saloon and the futuristic pilot cockpit, there is the galley with easy access from the port gangway. The whole interior layout may be fully customized for suiting all owner requirements while sharing building and material quality and fine - designing according to the standards commonly used for either Maiora or AB as well as for all the yachts by Fipa Group. Outside the rich full teak deck opens to the cockpit featuring generous sun pads right recessed in the area above the garage made for a tender. 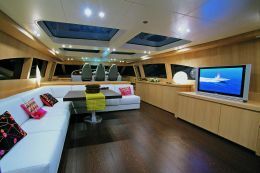 Forward of it, fitted in the deck house, there is a giant sun bed with access to the crew's quarter that consist of two berths, bathroom and cook corner.